I knew this book was going to be a hard read for me because I knew the ending was going to be sad, but I had no idea just how hard it would be for me to read, how very, very deeply it would affect me and how it would resonate with me on so many levels. Buckley's Story ripped my heart out. Buckley's Story starts out quite nicely. 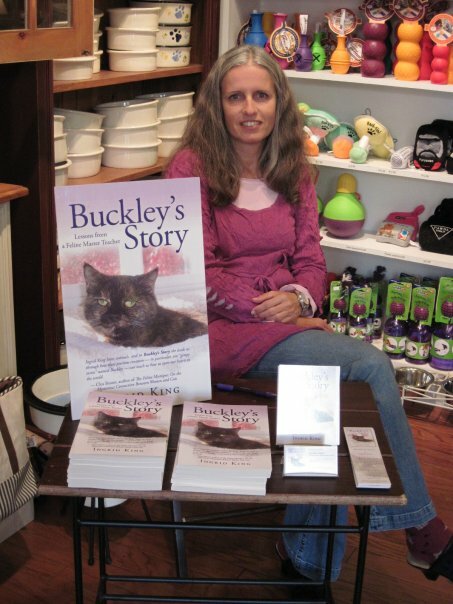 It details how the author (Ingrid King) came to meet Buckley "the little cat with the huge spirit" and a deformed rear leg when she was managing a Veterinary hospital. 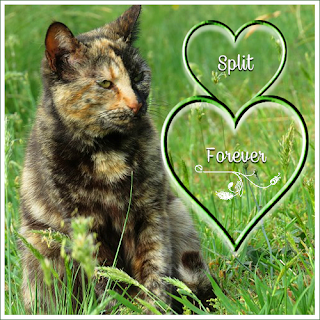 Ingrid describes this strong and feisty tortoiseshell cat by using the word "joy"
"She was a joyful being, and she brought joy to everyone who came into contact with her. Joy can be an elusive quality for many of us, but it is the ultimate goal of a life well lived." Webster's defines joy as "the emotion evoked by well-being, success, or good fortune, or by the prospect of possessing what one desires." Ingrid knew deep in her soul that a few of the things that Buckley desired was to live without the confines of a cage and to live in Ingrid's home along with her patient, understanding and wise cat (also a tortoiseshell cat) Amber. "Buckley was one of the two little cats, and she believed with all her heart that there was such a place and such a person just for her. She knew in the very depth of her being that some day she was going to find the person and that place. She never gave up on her dream, no matter how bad things were in the present moment." It took Ingrid a number of attempts of trying to move Buckley home with she and Amber to really "get" this. Ingrid also learned through Buckley that her own joy would come not by being employed by others but by listening to her heart and setting off to start a business of her own, a business that has led to many successful side ventures that without Buckley quite possibly she may have never tried. "Some of Buckley's freedom-seeking spirit started to rub off on me, and I began to explore other career options." Of the many lessons that Buckley taught Ingrid, one of the most important was to "stay in the moment and not get ahead of myself with worry." She had to repeat this to herself many times when Buckley was diagnosed with a heart condition. This is where the book hit too close to home. 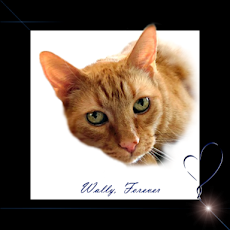 My beloved Bobo was diagnosed with a heart condition when he was approximately 16 yrs old. I was told during the original diagnosis that he would maybe have days, weeks or months. With the love, caring and professionalism of my Veterinarian (I was lucky enough to have a Vet similar to Jack and Janet who were Ingrid's friends/initial employers) my Bobo lived for 2 more years. I cried when Ingrid described with great professionalism/knowledge the details of the disease (labored breathing, water retention, etc.). I relived those final days spent with my "baby" as I read how Ingrid relived hers with Buckley. I cried as if I had lost my baby the day I read the book instead of the nearly 3 and a half years it has now been since he passed. Pet lovers "get this", not just cat lovers but anyone who has had to say a final goodbye to a beloved pet. "I think it's impossible to ever be completely comfortable with the decision to end the life of someone we love so much. We do not want our pets to suffer, and when we are really in tune with our animals, we know when they are ready to make their transition." "However, our animals also love us so much that they often stick around longer than they might want to because they know how much we will miss them when they're gone." "I believe that animals and humans are eternal beings. We never really die, we simply transition to a nonphysical state, and so do our animals." "The connection from soul to soul is eternal." That is one of the many "lessons from a feline master teacher" that Buckley has left us. That offers me great comfort. "Animals open our hearts. It's hard to resist unconditional love. We may try to stay guarded, but once an animal opens your heart, things change. And once your heart opens, life starts to expand." That....is Buckley's Story, and despite the tears, I loved it! For more information about Ingrid King or to purchase Buckley's Story, visit http://www.ingridking.com/ or http://www.iuniverse.com/, or call 1-800-AUTHORS, or visit your local book store or preferred on-line retailer. Thanks to Ingrid King the consummate cat professional for affording me the opportunity to review this wonderful book. I received no compensation, just a copy of a book that I will always treasure. I thought this was a great story. I like most of those sweet animal stories that have come out lately. Our mom cries at the drop of a dime! A good review as usual, Caren. You're wonderful. I really love the way you describe the book, the story and how the book affects you. Your reading is so detailed and yet so sensitive and full of sympathies. Oh dear, I think I need to prepare a box of Kleenex first!!! @The Kool~Kittie~Krew, I really don't....this one caught me off-guard because I made sure not to read any other reviews or anything pertaining to the book before I actually read it (I never want my opinion affected by anyone else's reviews/opinions) and I never expected the imagery to be so closely tied to my own experience. Tore me apart. I am a word "freak" and I read with great detail...quotes etc mean the world to me. I may be somewhat ornery sometimes but yes I am one sensitive cuss! lol!! I'm sorry abut your Bobo. Our eyes are leaking after reading your review. 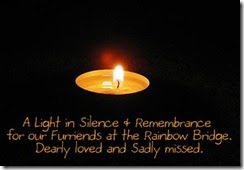 It's a real emotional struggle any time you have to help your beloved pets OTRB. Cathy thank you! I feel awful because I think I neglected to indicate that I really loved the book because I dwelled so much on the emotional aspect. I hope the fact that I really loved the book came across in the review! So very sorry about your Bobo. It's hard to relive those memories. This book sounds like an excellent read (even if it is sad). I do enjoy books even when they are sad, as it teaches us lessons. Excellent review Caren. Caren, that is a great review. I love Buckley's story and I'll bet it hits home with many people. Like Buckley to Ingrid, Bobo will be in your heart forever. It's so difficult to lose a pet, but like Ingrid said, the soul-to-soul connection is eternal. It is for me and the cats I have been so close to and then lost, sometimes quickly. I love emotional books and I know this one would strike a chord for me too! Thank you for this very special review, Caren. There's nothing more special to me than to hear that Buckley's Story has touched another heart so deeply. I'm sorry it brought back some painful memories about your Bobo, but I'm glad that it also provided comfort. My gimpy little tortie is smiling for sure. Mario thank you so much! I agree. Even if a book is sad I enjoy them for the lessons that they teach. I hope you can get a copy of the book and read it because Buckley also suffered from the same tooth condition that you did. I think the book will hugely touch you as well. Angie thank you so much! You would love the book I am sure. Yes you are so right. There are times that my Bobo "communicates" with me. When he was ill he used to sit in the hallway (I would see the shadow of his ears in the dark) He only did this when he was ill. My Cody occasionally will sit in the same spot (at night) and I know that is my Bobo communicating through Cody. Also...when Bobo was ill he used to sit in a chair in our spare bedroom (actually the cat litter/cat toy room! 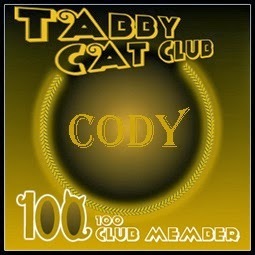 lol) and Cody sits in the SAME chair. Bobo only did it when he became ill. It is strange that Cody gravitated to the same place. Since you said you love emotional books you will love this one! Thanks so much again! Ingrid it was truly my pleasure. Even if the book made me cry it DID definitely bring me comfort. It brought comfort to me knowing that someone really understood (and understands) what a pet parent goes through at such a difficult time. Knowing that our "connection" is "eternal" comforted me more than you could imagine. Thank you for sharing your precious Buckley, dear, wise Amber and your heart with all of us! Oh I don't think I could do that much sad. 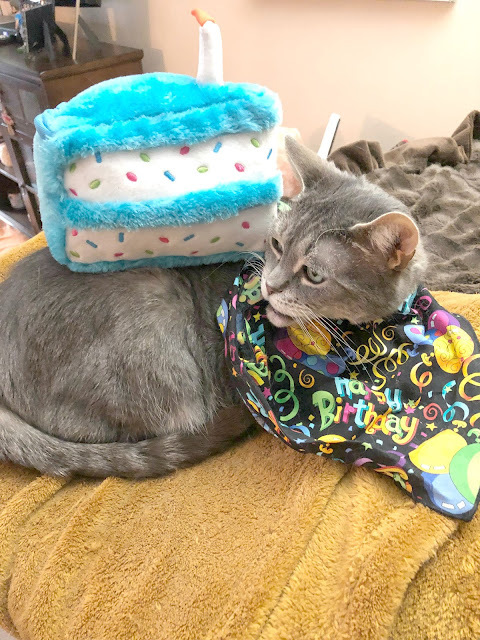 Thanks so much for sharing your heart with your kitty's passing in connection with this book. Thanks for the review. I probably won't read the book though. I find sad stories really difficult to read, and it usually puts me in a funk I can't get out of for days. That is amazing that your Bobo lived 2 more years. What a miracle cat…. He was lucky for his mommy! I so will have to read this book. Wonderful review! However, I think I may have to wait a bit….. Alex has had a rough time on and off, and one of my close friends is having a very difficult time with her dog, and I don’t know if I am ready for this read right now….. Dawn thank you and I am happy that you stopped by! @Fickle Cattle, I understand. Everyone is different. You have to do what is right for you, but the book as a whole is excellent, well-written and very worth taking a look at if you decide to do so. Very nice to meet you and I am checking to see if you have a blog, if so, I am going to check it out right now! @Hilary, thank you so much for your kind words! If you are going through a hard time with Alex now and your friend's dog the timing might not be the best but it is definitely a book that should be on your reading list for when you are able to handle it. Congratulations on making BLOG OF NOTE! The second I read "cat in the title, I jumped. That's because I'm a cat lady. Actually this past Saturday, we just held a special soiree celebrating black cats (the most euthanized and least adoptable of all cats). It was called Le Chat Noir! Check out the video at our website www.thecatnetwork.org. I'm trying to address homeless cats in downtown Miami--that's my turf. So wish us luck! There's so much work to be done when one lives in weather where cats flourish faster than rabbits! Hope to read the book soon. Let me know if you put up your Wordless Wednesday. Thank you for loving Bobo so much and so well, and for such a heartfelt review. It sounds like a really well-written book (and one that will have me crying in no time). What a lovely story, and Bobo sounds like such a special friend. It's so true that we can learn from our animals. I had to make the same big decision with my little Daisy last year (aged 18) and a light went out of my life. I haven't read this story and know I couldn't bear to; it's too close to home. Just reading Chicken Soup for the Soul on cats was bad enough, though a wonderful read. 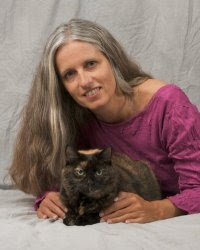 I have just reviewed Choosing to Be: Lessons in Living from a Feline Zen Master by Kat Tansey - recommend it - see my review and other catty stories on http://bookblogforbookworms.blogspot.com It includes details of courses on how to communicate with our pets. Cats are usually a delight; though ours is rather feisty ! great story！I love cat.They are so cute! I think I'll have to see if I can find this book. My uni course is almost done for the year, I have time to read! I've posted pics of the kittens I'm getting if anyone is interested in seeing some cuties! I am COMPLETELY blown away! Who voted me a "Blog Of Note?" Is there something I am supposed to do? (like post a badge or something?) I am sooo flattered and happy!! I was just in your website and found info on LeChat Noir but I can't find the video! Am I blind!??? I have just "liked" "The Cat Network" on facebook and was already following on Twitter! So pleased to meet you, I just woke up a bit ago so I am stunned! @Au and Target..."Wordless Wednesday" will be posted a bit late today because I am waiting for word from Clean+Green for a special surprise I have planned....It should be up by early afternoon at the latest! @meowmeowmans thank you!! Your words were so sweet, yes I believe you would enjoy the book! Thanks so much! @Bernard, I hope if you are a cat lover that you will check it out! @Inigo, yes Bobo was truly my "soul kitty" and the best kitty friend I could have ever had! @Diane, I am so deeply, deeply sorry about the loss of your beloved Daisy. She was the same age as my Bobo...I completely understand, in time you will be able to read it but I so know how you feel. I am on my way over to your blog in a few to check out your review. Thanks so much for stopping by! So nice to meet you! @blessingsgoddess as Martha Stewart would say, a "feisty" cat is a "good thing!!!" Where are the photos of your kitties posted? I would love to see! @onetreehill dvd, thank you!! Yes, cats are so precious! More of a doggie person myself but I love cats and have rescued over twenty in my lifetime. To me, animals are often so much better than people. They show unconditional love, compassion, resilience and so many other traits that us humans often forget to display or that even exist. I don't really like books like this because I'm the first one to bawl. Annah so nice to meet you! You have rescued over 20 cats? You are truly an angel! I have a dog as well (a Sheltie) whom I love dearly but after having had one cat for 18 yrs I know so much more about cats (and understand them) so much better than I understand dogs. I am an animal lover though and if I had a large home I would have LOTS of DOGS and CATS! Thanks so much for the Congrats on "Blog Of Note" I was stunned! A big Hi from Wales in the UK. Congratulations on being blog of note! I always check them out, but yours is the first I've put a comment on. How could I not, being a fellow cat lover? lol. It's a great blog. The story of Buckley sounds remarkable and will be checking it out. Carolyn it is a pleasure to meet you and I send you a "big hi" from Michigan! I have always wanted to visit Wales (and the rest of the UK) as I am sure it is gorgeous there! 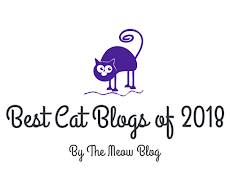 Thanks so much for the congrats and I am flattered that my blog is the first that you have chosen to comment on that you have found as a result of being selected a "Blog Of Note"! Thank you! 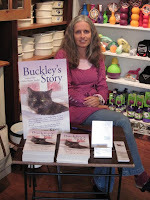 Let me know what you thought about "Buckley's Story" once you read it, yes it is remarkable! My Bobo was my only cat for 18 yrs and now I just have one named Cody (and a Sheltie named Dakota). Having one cat is as good as having MANY CATS! Caren thanks very much. I've put up a blog post at last :> There's a good pic if nothing else lol. Carolyn YAY! I will pop over and check it out! I am sure I will love it! Who knows, maybe there will be another give away of some sort that you will be able to be a part of. What a lovely review. Bobo sounds like an amazing cat, and I purr to ease your loss.